I’m pretty sure I have T-shirts older than the founder of River Creative Technology, the young Dutch company responsible for the module currently lighting up my case. Fortunately, the sophisticated-looking dark-blue panel demonstrates considerably more style than my dress sense. Size: 12HP. Current: +12V = 70mA, -12V = 65mA+5V = 30mA.Dendrites is a compact filter module consisting of 16 modes, accessed from a central encoder. Each group of low-pass, band-pass, high-pass and phase-shift filters is represented by a different coloured LED, so that even if you can’t read the text, you’ll have a fair idea by colour and position what type is currently selected. Blends of filtering and phasing are included too and for the record, filters 1-6 are green, 7-11 amber, 12-14 are red, leaving blue for the final pair. Further LEDs represent the signal strength, modulation amounts and polarity, plus whether the post-filter drive is engaged. For each of the available modes, both input saturation and drive have a huge effect on the tone and behaviour of the filter — I even became partial to driving the input into the red for a spot of aggressive clipping. You should be aware that, unlike some filters, the input attenuator is not designed to bring in the signal from silence; at the lowest setting, full-strength Eurorack signals are given clean passage. Many users happily accept sacrifices to reduce the hp count but in this case, I’m not sold on the tiny attenuverters for FM amount and envelope depth. To me, these are at least as important as the cutoff and resonance for live tweaking. Still, they do at least have a central zero notch. For the FM input, a switch offers either exponential or linear operation, but it’s not always easy to see its position against the dark-blue background. Otherwise, modulation is well catered for and even includes a separate 1V/oct input (0-10V) intended for keyboard tracking. As this is normaled at 5V, you might want to feed it a voltage source of your own choosing when the input isn’t being used, so the cutoff knob operates more traditionally. We still aren’t finished with voltage control either, because there are CV inputs for resonance (0-5V) and for direct control of the filter mode. You should put aside plenty of time to explore the modes on offer because some go beyond the norm. The trip starts with four low-pass filters, each of which has a progressively steeper roll-off of frequencies, ending in a decent-enough 24dB/oct slope. As these filters cover familiar ground, they are ideal for trying out different input levels, resonance settings and the biting effects of drive. I don’t think there’s a weak filter amongst them, but neither are there any whose character immediately stands out. There are sweet spots to be found, but this is where that exploration time comes in. The final two low-pass filters incorporate 1-pole and 2-pole phasing modes and here some of the Dendrites’ more distinct tones begin to emerge. The addition of even gentle phasing to a regular low-pass filter is a definite plus; as you progress through the other modes, it’s often the combination of a known type plus phasing that earns the most smiles. Especially with a tasteful dash of filter FM added. Since the band-pass filters are made from low- and high-pass combinations, some of the terms may initially be confusing. Fortunately the manual explains that a 3-1P filter is a band-pass formed from a 3-pole low-pass and 1-pole high-pass — easy when you know. Spinning the encoder, I was struck by how subtle variations can become far more pronounced according to resonance type and amount. 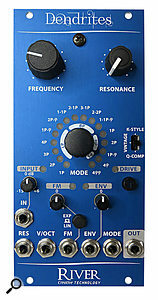 The three types of resonance offered are: Vintage, Q-comp and K-style. You should be aware that when resonance is anywhere past the nine o’clock mark, the filter output becomes significantly louder if you switch from vintage to either of the other modes. When no input signal is present and resonance is high enough to generate self-oscillation, the K-style setting (inspired by later Korg MS-20 filters) has a particularly powerful resonant thump. This was the resonance I turned to for kicks and other bass-heavy hits. In contrast, Q-comp features a boost of the input signal with increased resonance, negating the usual bass loss by extra saturation. If power isn’t your priority, the Vintage setting delivers the kind of smoothness that’s well suited to fluffy solos and spacey noodles. It’s a neat trick having CV control over resonance but I wasn’t sure how often I’d need external control of filter mode. To accomplish this a 5V source is mapped evenly over the range, and switching active filters can be a noisy business. To be fair, the manual does mention this and recommends patching in an external VCA to silence the output during CV-controlled mode changes. 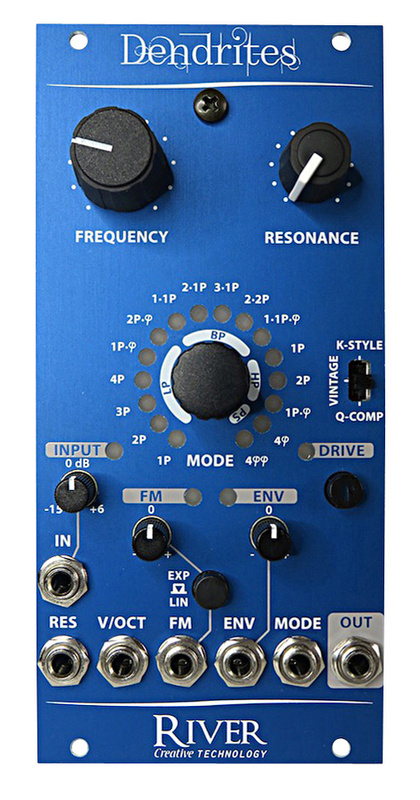 Clearly this is a module with a lot packed into it, and while old timers like me might yearn for larger knobs or silent filter switching, there are so many pluses it’s hard to hold a grudge. The Dendrites can be smooth, aggressive, squelchy or rip-roaring — the addition of phasing is the icing on the cake.